US team George Szabo and Rick Peters, current Star World Champions, are one of the attractions of this upcoming Star World Championship. The event's first race will take place this Saturday in Rio de Janeiro’s Guanabara Bay. 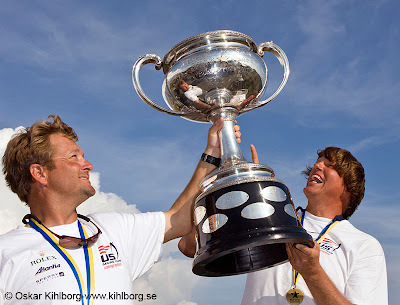 The two sailors from San Diego, California, are hoping for light winds so they can repeat last year’s feat, when they won their first gold medal in Varberg, Sweden. "We tend to sail better in light wind conditions so we are keeping our fingers crossed", says Szabo, who has been in Rio for less than a week and is still reeling from the 40 degrees Celsius heat he encountered in the city. "It feels like we have been here much longer", says Peters, jokingly. Canadian-Brazilian - Canadian Ross MacDonald, 1994 Star World Champion in San Diego, USA, Olympic silver medalist in Athens (2004) and bronze medalist in Barcelona (1992), is one of the most experienced sailors in this category, with 25 years of experience. Married to Brazilian Olympic athlete Marcia Pellicano, Ross speaks Portuguese and will compete in the World Championship with crew member André Lekszycki, from Niteroi. "It's great to compete in Brazil and try for another great outcome", says the Canadian sailor who lives in Vancouver, but has been in Rio de Janeiro for almost three months. He adds, "We have trained a lot and we know the race course very well." So far, the athlete has competed in five Olympics. Thursday morning Press Conference - Some of the Star World Championship’s top sailors will be available at a press conference this Thursday morning, starting at 10 a.m., in the Salão Nobre of the Rio de Janeiro Yacht Club in Urca. Journalists will have the opportunity to talk to reigning Star world champions George Szabo and Rick Peters (USA), 2007 world champions and 2008 Olympic silver medalists Robert Scheidt and Bruno Prada, Marcelo Ferreira (Brazil’s only two-time world champion -in 1990 and 1997), as well as Alan Adler and Nelson Falcão, the first Brazilians to become Star world champions in 1989. The Star World Championship 2010 is sponsoring by Banco do Brasil, Transpetro, Governo Federal, Gol Linhas Aéreas, Santa Constanza, Wollner and Secretaria Estadual de Turismo, Esporte e Lazer do Rio de Janeiro. The event is organized by Iate Clube do Rio de Janeiro, International Star Class Yacht Racing Association (ISCYRA), Confederação Brasileira de Vela e Motor (CBVM) and Federação de Vela do Estado do Rio de Janeiro (FEVERJ).